While Syracuse University students will begin the celebration earlier in the week, alumni from around the world will be welcomed back to campus Oct. 9-12 for Orange Central 2014. This year’s Orange Central celebration features events for alumni, current students, faculty, staff and the entire community. Free parking will be available at many locations around campus. Special reunions will be held for Class of 1964 (50th reunion), Class of 1984 (30th reunion), Class of 1989 (25th reunion), Kappa Alpha Theta (125th anniversary), Goon Squad (70th anniversary), Shaw Center (20th anniversary), Spirit Team (including cheerleading, Otto and dance team), Pride of the Orange Marching Band, SU Abroad, Generation Orange, Office of Residence Life and the Hendricks Chapel Choir. Orange Central will also include a football game on Saturday vs. Florida State. Game time is at noon. Register for Orange Central at http://orangecentral.syr.edu. For questions, contact the Office of Alumni Engagement at 1-800-SUALUMS (782-5867) or email orangecentral@syr.edu. Orange Central 2014 is a great time for students to show their Orange pride. Students can enjoy a week filled with SU traditions hosted by the Traditions Commission, with free food, T-shirts, prizes and more. Among the student Orange Central activities are Slice of Orange Days on Monday and Tuesday in the Schine Student Center. A Traditions Commission Trivia Night will be held on Wednesday. “DanceWorks Presents: Syracuse Horror Story,” featuring student performance groups, will be held on Friday (the Homecoming King and Queen will be announced at this event). More information on student Orange Central events can be found at http://orangecentral.syr.edu/. Thursday, Oct. 9, 2-4 p.m., Friday, Oct. 10, 1-3 p.m.
Get a custom passport and visit each of Maxwell’s more than 20 departments, centers and institutes. Stations throughout the buildings will showcase the history and expertise of individual academic and research units. Redeem stamped passports at the Maxwell Dean’s Office station, 200 Eggers Hall, for special souvenirs. Thursday, Oct. 9, 4-6 p.m. This 1924-themed event will celebrate Maxwell’s storied history. SyracuseCoE Headquarters, 727 E. Washington St.
CoE Executive Director Ed Bogucz will lead a tour of Central New York’s hub for research, development and educational projects related to clean and renewable energy, indoor environmental quality and water resources. Friday, Oct. 10, 9-11 a.m. Guided tours will be offered of Link Hall, the home of the College of Engineering and Computer Science, including the three-story structural engineering laboratory and the state-of-the-art flight simulator. Friday, Oct. 10, 10 a.m.
Andrew Saluti, assistant director of the Syracuse University Art Galleries, and David Prince, associate director of the SUArt Galleries and curator of collections, will offer a guided tour of art on campus. Friday, Oct. 10, 11:30 a.m. This luncheon celebrates all returning alumni and honors recipients of the George Arents Award, Syracuse University’s highest alumni honor. Watch as this year’s recipients—Richard M. Jones ’92, G’95, L’95; Angela Y. Robinson ’78 and Donald Schupak ’64, L’66—are recognized for being leaders in their fields. Tickets are $25 per person, and balcony seating is available for students for the award portion of the event. Reservations for the luncheon are required; visit http://orangecentral.syr.edu. Friday, Oct. 10, 12:45 p.m.
Friday, Oct. 10, 2-4 p.m.
Students will share their entrepreneurial ideas and compete in Syracuse University’s version of a shark tank. Find out what it takes to compete for startup funding and how the Raymond von Dran Innovation and Disruptive Entrepreneurship Accelerator (RvD IDEA) helps students explore entrepreneurship at the University. The crawl begins in Bird Library to view the improvements and upgrades completed there, and moves on to Carnegie Library to see the renovated reading room. The crawl will conclude at SUArt Galleries to view the exhibit featuring the photography of renowned photojournalist Margaret Bourke-White. Friday, Oct. 10, 2 p.m. Hear how Duncan Brown, associate professor of physics, has fine-tuned Astronomy 101 to undergraduates. A gallery tour will be given by Lucy Mulroney, interim director of Syracuse University Libraries Special Collections. Syracuse University Athletics will host a panel discussion with former student-athletes about their transition to life after SU sports. Panel participants are Julie Dunn Hammer ’03 (softball); Veronica Dyer Tearney ’00 (women’s track); Craig Forth ’05 (men’s basketball, 2003 national championship team); Anna Goodale ’05 (women’s rowing, Olympic gold medalist); and Rob Long ’12 (football). The moderator is Keri Potts ’98, G’99 (volleyball). Friday, Oct. 11, 2-4 p.m.
Institute for Veterans and Military Families, 700 University Ave.
For more information, contact 315-443-0141. Friday, Oct. 10, 2:30-4 p.m.
Friday, Oct. 10, 4 p.m.
Friday, Oct. 10, 4:30-5:30 p.m. Enjoy performances by College of Visual and Performing Arts students and faculty. Friday, Oct. 10, 5-8 p.m. This special dinner is for alumni who have already celebrated their 50th reunion, especially those from the classes of 1939, 1944, 1949, 1954 and 1959. Marylyn Ginsburg-Klaus ’56, G’57 and Irma Ginsberg Kalish ’45, H’07 will be presented with the Melvin A. Eggers Senior Alumni Award. Cocktails are at 5 p.m.; award presentation and dinner will be at 6 p.m. Tickets are $30 per person. Registration is required for this event at http://orangecentral.syr.edu. Friday, Oct. 10, 6-9 p.m. Alumni, faculty and staff are invited to enjoy an evening of friendship, delicious food from Dinosuar BBQ, local microbrews and the great music of Letizia and the Z Band. Admission is $25 per person. Friday, Oct. 10, 7:30 p.m.
Join physics faculty and graduate students for a rare opportunity to climb the winding staircase and gaze at the stars through the 1887 telescope in Holden Observatory. Saturday, Oct. 11, 10 a.m.
Former Shaw Center leadership interns, Syracuse University Literacy Corps tutors, campus and community partners and friends are invited to have breakfast with current staff and students, reflect on and celebrate the work of the center, and talk about future possibilities. Calling all former Goon Squad members! Come celebrate the 70th anniversary!Don’t leave home without your Jiminy Cricket button and Goon Squad hat or shirt. Enjoy this fun and memorable flashback through the years! This event honors alumni who have graduated within the past 10 years. Todd Rubin ’04 will be presented with the Generation Orange Alumni Award. Pay-as-you-go food will be available at the Syracuse University Concessions wagon. Syracuse University and local authors will be under the tent for a book signing sponsored by the Syracuse University Bookstore. Authors will include Bill Smullen G’74, Me’Shae Brooks Rolling G’90, Scott Pitoniak ’77, Ruth Ross ’79, Mike Borkowski and Armstead Kennedy Fisher ’07. 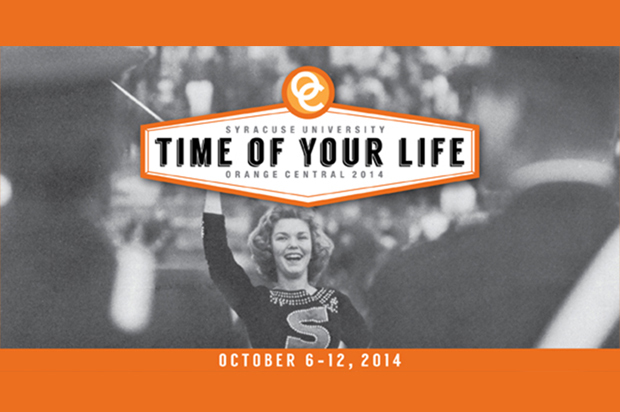 For more information on all Orange Central events, visit http://orangecentral.syr.edu.